Ireland finished this Six Nations as we started: a very poor imitation of the team that dominated last year’s tournament. It’s a very long time since I’ve felt as low leaving an away ground. It took me back to some of the thumpings we suffered in the ’90s, particularly on French soil. They were horrendous times, times we thought were long over. Losing happens. Success comes in cycles, we accept that. But when you lose with barely a whimper, as we did on Saturday, then it has to be time to reassess. In Cardiff we looked a team bereft of leadership. Where were the key leaders when we needed them most? I can’t name an Irish player who came out of this debacle with his reputation enhanced. James Ryan was again the epitome of honesty but he is just 22, and for all his talent he still has some growing up to do and experience to be gained before becoming the leader and future captain we know he will be. Him aside, I am struggling to identify an individual performance even close to the standard required and, in the Joe Schmidt era, expected. Gareth Anscombe’s precision perfect kick-off followed by Alun Wyn Jones’ carry and presentation paved the way for the Welsh out-half’s clearly preordained chip in behind the Irish midfield for Hadleigh Parkes to gather and cross. Just two minutes in and the Grand Slam chasers had the nerve-settler Warren Gatland would have been emphasising all week, and the two sides went in opposite directions from there. Schmidt is right when he says his team will come back from this, but without wishing to be smart, how could they not improve after the murkiest performance of his tenure by a distance? It was astonishing how one-sided this game was. After last week’s showing against France, particularly the opening half, I really felt we were in with a chance. And can someone out there please explain the logic in having the roof open when according to the Met office, rain was guaranteed to pour down in the Cardiff area on Saturday afternoon. Surely that is the purpose of the lid in the finest rugby stadium in the world? The result made us appear daft in wanting it open to let the rain sheet in, making fingertip handling nigh-on impossible. In a war of forward attrition there was only going to be one winner and it certainly wasn’t clad in green. To a man, except for Ryan, and one Tadhg Beirne turnover apart, we were shocking. If we were slow out of the blocks against the English, we didn’t even show up against the Welsh – stuck on nil until the final play of the game. 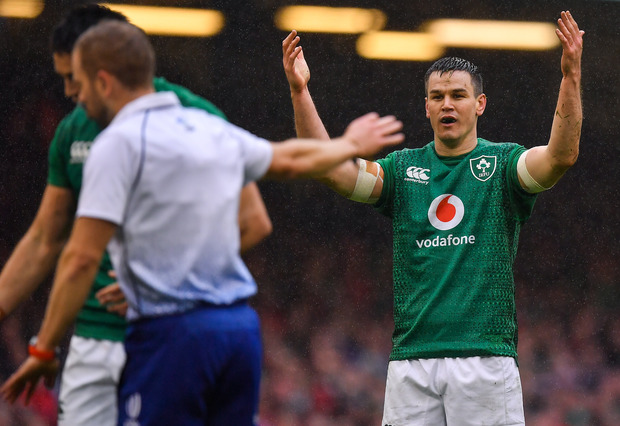 By no means is it the end of an era but certainly for key players like Cian Healy, Rory Best, Peter O’Mahony, CJ Stander, Conor Murray, Johnny Sexton and Rob Kearney, it’s time to look over their shoulders with concern. The upcoming European and Pro14 knock-out games will take on a meaning, in terms of Ireland selection, far beyond anything we would have envisaged before this Six Nations began. By contrast, for Warren Gatland it represented pretty much the perfect Six Nations send-off. His team were magnificent, dominating in every facet, and he was dignified after a thumping victory. It was the Kiwi’s third Grand Slam in his 12 campaigns at the helm of Welsh rugby. It is an extraordinary achievement, outdoing even Schmidt in terms of success rate. For us, it is a big setback with the World Cup looming, and however much the players will claim otherwise, it will affect confidence within the squad. Winning fuels confidence and confidence fuels performance. I have said it before: we are nowhere near as good as we think we are, but neither are we as bad as we appeared on Saturday. What seemed a settled side going into this Six Nations is no longer that. I will be astonished if Schmidt, Andy Farrell or any of the management team view it any other way. It was always going to take a mammoth effort to get to a World Cup semi-final for the first tim. Saturday’s no-show has made that task even harder again. And let no one kid you otherwise.